There are many things that people will collect. One of the less obvious choices is that of collecting vintage cheques. I collect too many things already but I can see the appeal of this. It`s an object that tells a story, a record of a transaction that took place between two parties in the past. 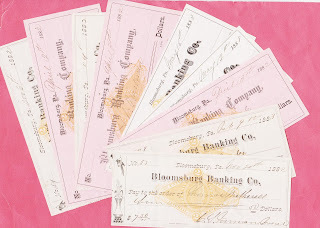 The cheques may be drawn on banks that no longer exist in that form. The account holders may be ( to pick a few random examples from past and present stock ) a historic brewery, a hospital, a firm of valuers or some other organisation. The firm concerned may have had their own cheques designed to highlight their company name. The particular cheques in our picture are from a US bank, Bloomsburg Banking Company, and date from the nineteeenth century. We have nine of these, with four for sale singly and the remaining five available as a job lot. Visit our e-bay shop to find out more.